There are estimates indicating that roughly 25 million Americans are without full-time employment. This total is nearly equal to the population of the state of Texas. In addition, if you read the various impacts unemployment can have on an individual’s family, their personal psychology and health, as well as society, the weight and seriousness of the situation is daunting. Having served in the financial industry for over fifteen years, most recently as a national director for one of the country’s largest banks, I too have endured the good, the bad and the ugly consequences of unemployment – on several occasions. I have had the experience of both delivering the news and receiving the news, all due to the various initiatives corporations occasionally engage, such as layoffs, restructuring and displacements. Although difficult at times not to take these situations personally, I have understood this to be part of business that’s difficult to avoid, and it has been my biblical worldview that has been most impactful in getting me through these challenging times. In my experience, it didn’t matter how successful one’s performance was, how well goals were surpassed, or how well one was respected and admired in the organization. In the end, a financial and strategic decision was made in order to grow revenues and stream line processes and then it was executed. It’s never easy and some of the delivery and communications are handled better than others, but in the end, these are typically business decisions and not personal. Granted, there are those who have endured unfair persecution from their employer, but I believe the five biblical truths that have helped me persevere, can serve to help others as well strengthen their joy, faith and hope during the undesired days of unemployment, no matter the cause. God has a Reason. For believers in Jesus Christ, we know God is in control and has a reason for allowing all things (Romans 11:36). We don’t always understand God’s plan, but if we continue to seek Him, obey Him and trust in Him, we will look back later in life and see God’s purpose for it all (Proverbs 3:5). For me, my initial reaction was to cling to a job, because my limited perspective caused me to want to keep what I knew, but in clinging, we risk not receiving something new and perhaps even better. As an example, we see in Acts 27 where Paul’s travel to Rome was interrupted by a storm causing his ship to crash. If Paul’s focus had been clinging to the ship, an opportunity to share the gospel with an entire island would have been lost. The ship, the storm and the crash served as the means for God to work through Paul to save spiritual lives. Therefore, each transition we encounter can strengthen our faith and develop our skills for greater opportunities to serve Christ – if we allow it. 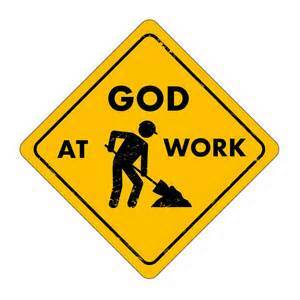 God uses it to Refine. Believers also know that God is always making us to be more like His Son (Romans 8:29). Therefore, He is always challenging us and pushing us out of our comfort zones toward stronger faith. I know this has been true for me. He prunes us, which can be temporarily painful, so that we can bear more fruit for His glory, and as we persevere through our various trials, we’re made stronger encouragers for others (John 15:2). God strengthens Relationships. As a result of trials, we can choose to turn closer to God, or run farther from Him. When we surrender and trust God, the struggles of life cause our prayer life to grow richer, deeper and more intimate (Isaiah 46:4). We also find our study of His Word becomes more explosive and illuminating as we seek to apply what we’re learning about God and not what we’re feeling. During trials, we also discover our relationship with Christ grows, which impacts our relations with others, in that we are able to share a deeper understanding and concern for their challenges and struggles. We are able to offer comfort in new areas, where we once could not and are able to serve needs, we were once blinded to (2 Corinthians 1:4). Our faith is Rewarded. God always rewards those who are faithful. It may not be in the way we want at first, or as fast as we want it, but there are none the less great rewards. For example, as just illustrated, our reliance on Him is strengthened, our relationship with Him and with others is empowered, and our faith and skills are refined and proven true for His greater use. This is much like a student who studies and is then tested to ensure they can apply what they have learned (1 Peter 4:12). Lastly, God proves he can be trusted to meet all our needs as we realize His reasons behind our trials are to glorify His name, expand His Kingdom and serve Him through serving others (Jeremiah 29:11). Although unemployment is typically not something anyone desires, each encounter for me has provided some of the greatest gifts God has ever given me. For I know that in all things God works for the good of those who love him, and who have been called according to his purpose (Romans 8:28). In addition, I have learned that no matter how high I climb on the corporate ladder, no matter how successful I may be perceived by my peers and no matter how much money I make, it can all be gone in a matter of seconds. None of it offers a firm foundation to depend on, and although I give my best at all times for the glory of God, my performance does not direct my life path. Rather, it is God who is solely in control, at all times, and if I am willing and available, He will direct my path, make it straight and place my feet on a firm foundation serving Him (Proverbs 16:9). So, like Paul, who served as a tent maker, and I have no doubt, produced an incredible product, he never lost focus of his true calling and his true job – to be a servant of God. Therefore, he was never jobless no matter what his circumstances were, and neither are we. God has given us a full-time job too in His Kingdom and provides the strength and means for us to accomplish it, as we seek to faithfully honor and obey Him (Hebrews 13:21). We can expect to face hardships, and thankfully unemployment is only temporary, but with a biblical perspective, we can take comfort in faith and rejoice knowing that our trials prove to be some of the most powerful times God uses to strengthen us spiritually and in our walk with Him (Judges 3:1).